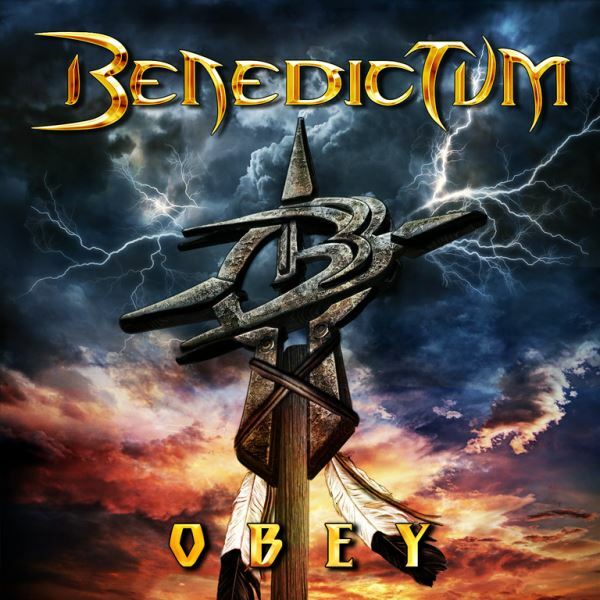 BENEDICTUM's new album, "Obey", will be released on November 29 in Europe and December 3 in North America via Frontiers Records. With a sound that nods to the legends of metal such as early RAINBOW, the stylings of SAVATAGE, WARRIOR, ROUGH CUTT, and PSYCHOTIC WALTZ, along with shades of BLACK SABBATH; BENEDICTUM unleashes "Obey" that will surely bring pleasure to the gods of heavy metal and their legions of fans around the world. Led by the sultry and powerful vocal gymnastics of lead singer Veronica Freeman, whose voice has been praised on the television show "That Metal Show" on VH1 Classic, BENEDICTUM displays a plethora of aggressive riffs, fierce rhythms, and powerful melodies full of delicate textures that grow spikes with shredding leads to converge at the crossroads of tradition and innovation. The rise of BENEDICTUM began when the band caught the ear and attention of DIO guitarist Craig Goldy, who in turn had his friend Jeff Pilson (DOKKEN, DIO, FOREIGNER) check them out. With the group's raw power and pure potential just beginning to surface, Pilson then produced and recorded BENEDICTUM's debut album, "Uncreation", in 2005. The band garnered rave reviews and won over enthusiastic fist-pumping fans rapidly. Their second album, "Seasons Of Tragedy", released in 2008 to more undeniable metal love from around the world. All of this led to BENEDICTUM being signed to a contract with Frontiers Records and further upping the ante in the studio. The band and Grammy Award-winning producer Ryan Greene (MEGADETH, F5, NOFX) joined forces for 2011's "Dominion" and BENEDICTUM had arrived. The band jumped onto the world stage, playing such events as Wacken Open Air festival, Doro's "Warrior Soul" tour, Headbangers Open Air and more. The CD was also a pick of the week by Don Jamison on "That Metal Show". BENEDICTUM went through some personnel changes and challenges, but has landed on the soles of The V's high-heeled boots to record its highly anticipated fourth album, "Obey". Joining founding members Veronica Freeman and Pete Wells are Rikard Stjernquist (JAG PANZER) on drums and Aric Avina (TYNATOR) on bass. There is an unmistakable swell of excitement building in chat rooms and fan pages online not only for the album, but to also have BENEDICTUM perform at a venue near them soon.